Neutralize Big Bad Malware & Data Breaches In Their Tracks. Find out how to combat sneaky malware and data breaches and win. What do CISOs consider to be their top risk right now? Hands down, the answer is stealth malware and sensitive data breaches. These days due to BYOD and cloud adoption, there’s just no way to keep all data in a controlled environment. To fight back, CISOs have turned from strictly preventative methods to adding detection as a key warrior in the battle for keeping their sensitive data safe and sound. How to secure personal devices from malware without losing user trust? What are the limitations of pushing data to the cloud? What other security controls are top priority for CISOs in the next 3-5 years? This report is just one of the many resources you will find in Wisegate’s extensive library. Peruse a wealth of information created to help you and your business be safer, smarter, and more prosperous. Download this report now and fight back against vicious malware and data breeches. Download the Report—Malware & Data Breaches: Combatting the Biggest Threat. As simple as posting a question on your smart device and in minutes you get advice from your IT peers. Questions, answers, and content sharing — for trusted, timely resources you can put to use now. Based on YOUR specific IT challenges. No broad enterprise or industry agendas here. Live roundtable calls, brokered 1:1 discussions and Q&A sessions. You've heard all about chains and their weakest links; about birds of a feather; about great minds... and we have too. Which is why at Wisegate, we make sure that all of our members are highly experienced, extremely knowledgeable, senior IT professionals. "You have this open forum to allow people to share their ideas and draw their own conclusions... that to me is compelling." "I think Wisegate is helping evolve information security as a profession." 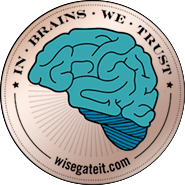 Interested in Becoming a Wisegate Member? Wisegate is an invitation-only crowdsourced collaboration service for IT leaders. Part knowledge community, part analyst firm, Wisegate unlocks the traditional knowledge gates, connecting peers, hosting virtual roundtables, producing and analyzing customized research, and more. Wisegate is an invitation-only crowdsourced collaboration service for IT leaders. Part knowledge community, part analyst firm, Wisegate unlocks the traditional knowledge gates, connecting peers, hosting virtual roundtables, and producing and analyzing customized research, surveys, and more.